Our third undervalued QB heading into the 2015 season is someone who is coming off an ACL injury – Carson Palmer. But of course, we are looking at this from a DFS perspective, not your traditional draft for regular fantasy. Obviously, injuries aren’t a primary concern. Palmer is $7,700 on FanDuel (16th highest QB) and $6,500 on DraftKings (18th highest QB). This might seem fairly accurate to most people, but since Palmer joined the Arizona Cardinals in 2013, he’s been putting up fantastic numbers. Before I dive into this – while I fully understand Palmer’s price point shouldn’t be compared to what he’s done in previous seasons as opposed to what other QBs are doing in today’s NFL, usage percentage in lineups for NFL DFS does strongly correlate to perception among fans. This is something more important for GPPS and creating unique lineups, but still, no one appears to be high on Palmer this year whether it’s from a DFS perspective or simply being a great QB. Sticking with DFS, a lot of DFS players are shy in the beginning of the NFL season with taking players who didn’t just come off an amazing season, or don’t have a lot of hype. The fact is – Palmer is coming off a great 2014 season that was just shortened. You’ll notice in 2013 that Palmer threw for a career high 4,274 yards, which ranks eighth that season. Despite that he threw for only 24 TDs and a career-worst 22 INTs, his 4,274 yards were still great enough for him to finish as the eighth best QB in FPTS scored. One of the biggest factors for Palmer’s INTs was how poor the Cardinals OL was. Palmer took a beating with a career-worst 41 sacks, which was eighth most of all QBs that season. Yet, the Cardinals went 10-6 in Bruce Arians’ first year as the head coach with his somewhat pass-happy scheme. If you want to make the argument that Rashard Mendenhall was the lead back that season with 841 yards, the Cardinals averaged 96.3 rushing yards per game (23rd) and that the Cardinals running game was essentially nonexistent, I’d somewhat agree. However, 2014 changed quite a bit. The OL improved drastically in both run blocking and pass protection. While Palmer only played six games, he averaged 271 yards through the air, which was on a slightly better pace than 2013, and he was still eighth best in the NFL. Furthermore, he only threw three INTs (INT% easily lowest in career) and his sack percentage went down significantly. Palmer was 6-0 as the starting QB last year. As for the running game, the leading rusher was Andre Ellington at 660 yards, and Arizona was 31st in the NFL in rushing at 81.8 yards per game. So, despite a much improved OL, Palmer going 6-0 and Arizona finishing 11-5 (best record since going 11-3 in 1975), the Cardinals continued to attack through the air. Unlike a lot of teams (Cowboys a great example in 2014) where they improve on offense through the offensive line and run the ball more effectively, the Cardinals’ tactics didn’t change. This is typical Bruce Arians. While he does play to the strengths of his team, he likes to attack through the air. He’s the best offensive mind and coach in Palmer’s career both from a fantasy and football success standpoint. Not only is Arians back for 2015, Harold Goodwin is also back in his third year as offensive coordinator. Future Hall-of-Famer Larry Fitzgerald, rising star Michael Floyd and young phenom John Brown are back at wide receiver. The three of them combined for 2,321 receiving yards. All the running backs return healthy, and third-round pick David Johnson should have the chance to provide some PPR numbers to help Palmer out of the backfield. The three losses as far as receptions go are minimal. Ted Ginn Jr (14 receptions for 190 yards) is the only WR to leave as he heads off to Carolina. While a nice deep threat, Brown primarily fills that role now. Tight ends John Carlson (retired) and Rob Housler (Browns) haven’t provided much in the passing game, and while we don’t know who might step up in that department this year, it would be a lot easier for this area to improve than fall back. OL is the only place you will see a change. Since Lyle Sendlein re-signed with the Cardinals, Paul Fanaika is their only loss, which isn’t a big deal. His replacement? Arizona picked up former Pro Bowler Mike Iupati, which should be a solid improvement, but Iupati won’t be available until around the end of September or beginning of October. He will undergo arthroscopic knee surgery. Even so, the Cardinals also have Jonathan Cooper, their No. 7 overall draft pick from 2013. He missed all of 2013 with a broken leg, started two games at the end of last season (did well) and is expected to have a great NFL season. Simply said, the Cardinals have been investing heavily in the OL through the draft and free agency since Arians arrived in Arizona, and their line should be as good or better in 2015. 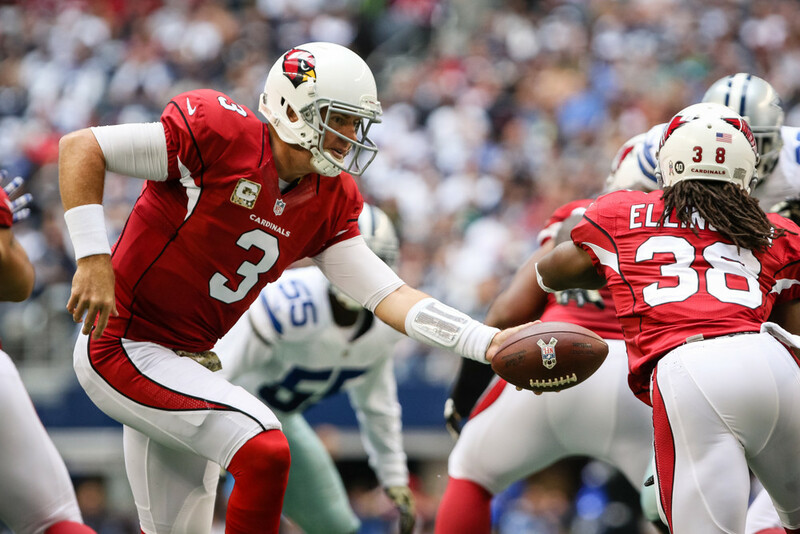 The Cardinals statistically had a very bizarre year when it came to the red zone. Not only did they only have 6.3 red zone attempts per game (29th), they turned that into a mere 17.2 points. This is why the Cardinals were 30th in red zone TD percentage at 41.67%. If your skeptical , you’re probably saying, “Shouldn’t teams that barely get to the red zone be bad at scoring touchdowns?” There is a small correlation, but it’s not a strong one. The Denver Broncos have been amazing under Peyton Manning. In 2014, they were fourth in red zone scoring attempts, first in red zone points and fourth in red zone TD percentage. In 2013, they were first in all three categories. In 2012, they were second in red zone attempts, second in red zone points and sixth in red zone TD percentage. It’s simply the Manning effect. In contrast, the Oakland Raiders were last in red zone offense and 30th in red zone points, but they were easily first in red zone TD percentage. In 2013, they were 29th in red zone attempts and 26th in red zone points, but they were sixth in TD percentage. Oakland was simply running well in the TD department. So, yes, that means their offense arguably should have been worse the last two seasons. Now that you see Arizona was 30th in red zone TD percentage, you’ll notice the Cardinals were only 25th in yards per play, which isn’t very good. However, in 2013, Arizona was 14th in yards per play when they had a healthy Palmer for all 16 games. Arizona moved the ball very well when Palmer was at QB in 2014, but he was only in there for six games, which made then rely more on their defense. That got them into the playoffs, but we saw how inept their offense was once they got to the playoffs without him or Drew Stanton. Now that Palmer has an improved OL in 2015 and as long as he stays healthy, I fully expect Arizona to be at least in the top half of the league in yards per play with a possibility of top 10. Then if you throw on the expectation that their bad luck will even out in 2015 and start converting more TDs, their offense should be much improved in points per game, which ultimately makes Palmer put up more FPTS. While DFS players are only concerned about weekly production, to put it in perspective of his value, I’m calling for Palmer to finish top 10 in QB fantasy points while he’s priced the 16th-most expensive on FanDuel and 18th-most expensive on DraftKings. Bonus: the Cardinals are hosting the Saints Week 1. New Orleans had a horrific year defensively last season. They also lose Curtis Lofton, Corey White and Patrick Robinson. The Cardinals are projected to score 25 points (fifth-most in Week 1) and are favorites at home. He’s a solid sneaky pick out of the gate and has particularly great value on DraftKings.